India is a signatory to the UN Convention on the Rights of Persons with Disabilities (UNCRPD) and has an obligation to ensure access to Persons with Disabilities [PwDs] on an equal basis, across facilities and services. However, when our census portrays that the differently-abled constitute only 2-3% of our total population as compared to the United States which believes that 20% of its population has some form of disability, it shows gaps in our approach to assistive devices as well. Recently the Indian government has becomeactive towards solving challenges faced by the disabled population. Its approach that disability also includes those whoarenot disabled by birth but may have acquired it medically or via an accident is a marked and welcome shift. Therefore ‘Sugamya Bharat’ or the ‘Accessible India’ campaign will not just help the differently-abled but also provide access to others, say the old.This nation-wide campaign for achieving universal accessibility for PwDs covers the built-up environment, transportation eco-system and information & communication eco-system. The differently-abled feel disabled either when they don’t have the external environment which suits them and/or they don’t have the right assistive technologies which can make their lives easier. 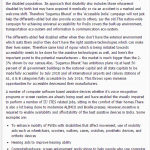 Therefore same kind of rigour which is being initiated towards accessibility needs to be done for the assistive technologies as well, and here’s the important point to the potential manufacturers – the market is much bigger than the 2-3% shown by our census.Also, ‘Sugamya Bharat’ has ambitious plans viz.at least 50 percent of all government buildings in the national capital and all state capitals to be made‘fully accessible’ by July 2018 and all international airports and railway stations of A1, A & B categories fully accessible by July 2016. This throws open immense opportunities for accessible devicesand their manufacturers. Let’s take just one example – the price of good quality wheelchairsis prohibitive and most of them are imported. If there is impetus/incentivising by the government for manufacturing, industry will see the big market opportunity and would react ina big way. This will facilitate the participation of the differently-abled in community and society at large. Majority of PwDs require assistive technology to overcome their disability and improve their functions, mobility and most significantly, independence. There is all-round development in such assistive technology world over. To be able to localize manufacturing and provide improvised assistive devices at affordable prices will go a long way in rehabilitation of PwDs, enhancing their quality of life and fulfilling the vision of a ‘Accessible India’.